Western frontier style is coming into fashion! I've always been against looking like a cowboy, but recently I've started to really like the more rugged aspects of the aesthetic - goes to show you that every style can have a twist you'll like so keep an open mind! 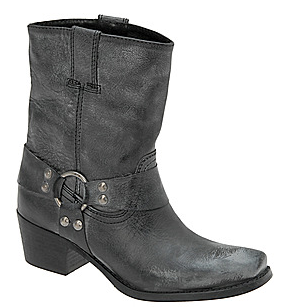 Motorcycle boots overall are just cowboy boots with a rounder toe; perfect for the edgy fashionista who wants to try out this trend! Buy this pair at Aldo for the sale price of just $85. I think this Shoes Are really Nice To save your foots Form Oil and Grease...I really like Your Effort! Keep it up!